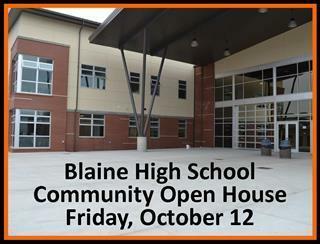 With the first two phases of construction complete at Blaine High School, parents and patrons are invited to tour the facility on Friday, October 12. Guided tours will be provided every 15 minutes from 5:00-6:15pm. Visitors are also invited to stay for the Homecoming Chili Feed, sponsored by the Blaine Booster Club, starting at 5:00pm in the new cafeteria ($5 per person). Parking is now available in the new lot on the south side of the High School, as well as in the main campus lot. We are excited to share this beautiful new facility with our local community members!